Help reduce the use of plastic and paper bags with our sturdy shopping bags. 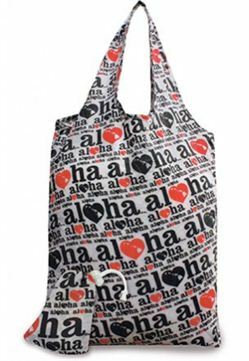 These colorful, stylish and practical foldable totes are polyester - extremely light weight and durable. Fold into their own little pouches with elastic closure and plastic stopper for easy storage and travel. This bag is so cute and durable. Perfect for toting things that wont fit in my purse. Have it strung on the side of my purse so it’s available whenever I need it!